We are working on it. We will get back to you soon. We are still working on it. We will get back to you soon. You seriously need to improve your writing skills. Content is not important, You just need to write something. Second Part: You haven't written anything worthwhile for ages. Most people think this blog is dead. Who are you writing for? 1 : Don't miss this opportunity to get your blog going again. Writing about movies is the easiest thing to do. Do it before the New Year fever dies. And, as long as there are a few people who say that anything you write is good, you have got nothing to worry about. 2 : You don't see a lot of movies. You have missed many supposedly good movies. Your list will not consider all movies. And, there were at least 4 movies having Dhanush in it this year. Your list will be biased. 1 : So what? There are no impartial reveiwers. 2 : You are not a reviewer. You neither have a critic's eye, nor a common man's eye. You love movies like Arai En 305il Kadavul, Baba and Ratchagan, whereas you hate the commercially successful 7Am Arivu. 1 : Enough. Stop wasting time and space, and start writing already. Well, such debates are not unusual within me, and I usually (and evidently) succumb to the second part of my mind.For once, I decided to go with the other part of my mind. So, here goes the list.. Shocking? This movie is here only to complete the list. I don't completely love this movie, and wouldn't recommend it to everyone. But, I feel it is worth a watch for some fantastic performances, lead by Simbhu, Saranya Mohan, Anushka, and Prakash Raj. A novel screenplay in Tamil movies that has five diffent storilines. It traces the stories of Cable Raja (Simbhu) who wants money desperately to continue his relationship with his girlfriend, Bharath(Bharath) a rich and spoilt rockstar, Saroja(Anuska) a prostitute, a muslim couple Rahim(Prakash Raj) and Zara (Sonia Aggarwal), and Lakshmi (Saranya Ponvanan) - a poor women trying to raise some money to rescue her son from a debtor.The movie deals with the sufferings of the poor without going overboard. Simbhu's acting when he is reluctantly forced to steal from others is the one of the biggest reasons I love this movie. I am not sure where exactly this movie should be in this list. I have placed this so low just because it is a commercial/mass movie. Directed by K.V.Anand, the movie is a very good entertainer. The thing I like about K.V.Anand is that he doesn't seem to take himself very seriously. To me, a good actor is one watching whom you don't realise he is acting. In that way, Jeeva does a fantastic job. So do Pia Bajpai, Ajmal, Prakash Raj and Kota Sreenivasa Rao. The situations happening in the the press offices are delightful. After all, K.V.Anand was himself a photo journalist. We will have to wait and see if the movie's upcoming Hindi remake will be as good. After giving some delightful movies like Azhagiya Theeye, Mozhi, Abhiyum Naanum, director Radha Mohan attempted a thriller. The movie is about a hijacked flight. With all the passengers held hostage, a national Security Guard(Nagarjun) and a National Security Advisor (Prakash Raj) formulate a plan to rescue them. Though the movie did fail on the thrill quotient, it still had some of the elements that made the director's earlier movies great. It had some fantastic performances by almost all actors, led by Nagarjun, Prakash Raj and my favorite Chaams. Though the screenplay had its share off loopholes, I was ready to forget them seeing the scene where Nagarjun asks "Red Hills ah? Adhu evalavu thuram?" . The scene showed that the makers were atleast trying to have a semblance of logic. (As a side note,in Dasavatharam, Flethcher was able to navigate throughout Tamil Nadu as if he was in his own backyard). A movie from one of my favorite directors Myshkin should have been higher up on the list, but I hated the second half of this movie. J.K. (Cheran) is a CB-CID officer, whose sister goes missing. With no clues to trace his sister, he reluctantly takes up another case where a series of people are being brutally murdered. But as he digs deeper into the case, it looks like the case is related to another case, where a series of women including his own sister go missing. The first half of the movie is great, with Cheran's acting being a revealation, but the climax turns out to resemble a zombie movie.Worth a watch for its fantastic screenplay, and some signature scenes from Myshkin. A Selvaraghavan-Dhanush movie. The movie traces the life of Karthik(Dhanush), a wannabe wild life photographer. He and his sister are supported by his group of friends Sundhar, Sankar, padmini and Vindhya. The arrival of Sundhar's girl friend Yamini (Richa Gangopadhyay) changes his life, for bad, and for good. Like any other Selvaraghavan movie, the movie has some wonderful scenes, and some ordinary scenes. Frankly, I am unable to decide if this movie is really good. But, no one can deny that Selvaraghavan can extract the best out of my favorite actor, Dhanush. 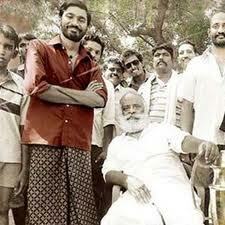 And as expected, Dhanush's acting is stunning. Like Selva's other movies, all characters are realistic, because no character is perfect. And this movie will go down as a rare Selvaraghavan movie that has a happily-ever-after ending. The third movie by director Suseenthran, and as good as the first two, if not more. The director's fourth movie also finds a place in this blog post, further below. With no big names in the cast, this movie is about a superstitious village Mallayapuram near Theni. Just before the annual Temple Festival (Thiruvizha) of the village, someone steals the wooden horse considered as the village diety Azhagarsamy's vehicle (Vahanam). The villagers are convinced that the horse belonging to another youth (the unlikely Protogonist, again called Azhagarsamy) is the diety's own horse, magically given a life of its own. The movie is about how the young lad, whose livelyhood depends upon his horse, gets it back. Each character in the movie is delightful. Just in case you didn't know, the music is by Maestro Illayaraja. Directed by debuttante Kumararaja, it is the Tamil(or even Indian) movie that is closest to the class of a Quentin Tarantino's creation. The actions of a wannabe-big-gangster Pashupathy (Sampath, one of the finest actors) cause an explosive cascade of events, touching the lives of the ageing old don Singa Perumal (a brillian Jackie Shroff), an innocent and ridiculed misfit Sappai (Ravi Krishna), a wannabe actress held in the clutches of Singaperuma - Subbu (Yasmin Ponnappa), the pauper farmer Kalayan (an excellent find, Somasundaram) and his son Kodukkupulli (Master Vasaanth). Yuvan Sankar Raja's stunning BGM is worth a mention. The national award winning movie directed by Vetrimaran (his second movie after the really good Pollathavan), and starring Dhanush. The movie is set in a backdrop of Rooster Fights. Pettaikaran (Jayabalan) is the most reverred name in rooster figths, assisted by Karuppu(Dhanush) and Durai (The fantastic actor Kishore).Rathnasamy is their arch competetor. In the heat of an important competition, Karuppu decides to go against the better judgements of Pettaikaran. The movie deals with the emotional fallout of this action. The thing that strikes me the most about this movie is the raw emotions that each character in the movie has. Even the heros sidekick gets angry at a point of time. Every single actor does justice to the characters he/she plays. Though many people felt that the second half of the movie to be slow, I personally love it. Produced by director A.R.Murugadoss, and directed by debutante Saravanan, this is a delightful movie. Though most people I know would cringe at what I am going to say, to me this is a feel good movie. I felt really good for 3/4th of the movie. The movie starts and ends with a bus accident, and traces the story of two couples involved in the accident. A fantastic screenplay, with a liberal dose of really good humour makes this movie a must watch. The scene depicting the actual accident has so much impact that some people I know hesitate to travel by road after watching this movie. The movie's greatness lies in the fact that there is no single thing that really stands out. This movie was lauded by almost everyone who saw it, but I still feel that it has been under-rated. 1) Aanmai Thavarael - A movie about human traficking, that got pretty decent reviews. 2) Muran - An adaptation of the Alfred Hitchcock's Strangers on a Train. Starring Cheran and prasanna, this movie got rave reviews. 3) Vaagai Sooda Vaa - Directed by Sarkunam of Kalavani fame, and starring actor Vimal. The movie is set in 1960s, and is about an teacher who tries to educate the children of a village. 4) Mouna Guru : Directed by Santha Kumar, and starring Karunanidhi's grandson Arulnithi, no one would have cared for this movie. But unexpectedly, it has made its way to the top 5 list of every critic I respect. It is supposed to be among the best thrillers in Tamil. 5) Nadunissi Naaygal : Directed by Gautham Menon, and starring Sameera Reddy, this movie is in the list of everyone's worst-movies-of-the-year list. Isn't that reason enough to watch it once? And finally, a word of advice on certain movies that you should avoid at all costs (Please note that this list is by no means exhaustive. After all, 134 movies were released in Kollywood last year). 1) Nootrenbadhu(180) : Directed by Actor Jayendra, and starring actor Siddharth, whose twitter biopic reads "Stuck in the wrestling match between commerce and art", this goes down as one of the most hypocritical movie I have ever scene. There is not even a single shred of logic in the movie. 3) 7Am Arivu : Directed by A.R.Murugadoss, a movie full of crap. I strongly suspect that the director has been influenced by Aamir Khan. 4) Rajapattai : Vikram has shown a strong influence to bad movies in the past, and Rajapattai is a real bad movie. I have added this here just because this movie is directed by Suseendhran, whose earlier movie Azhagarsamiyin Kudhirai (4th in the list above) was a complete commercial failure. PPS : After posting the blog, I realised that I had missed a important movie, Deiva Thirumagal. This movie would definitely be in my top 10- probably before Yudham Sei.